Naina Devi temple on a hill top of Bilaspur in Himachal Pardesh is quite famous where heavy rush of devotees is noticed on specific occasions. 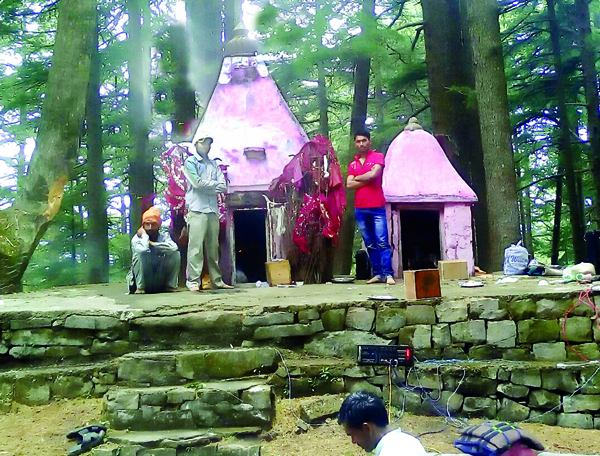 The temple of Mata Naina Devi located amidst dense forest of Badan forest could not gain much popularity owing to non connectivity with road and its location in far flung area. The temple is an old shrine of Mata Naina Devi located in a tranquil spot of maginficient beauty of deodar trees. The bridle track from village Bap, Sarar, and Mantalai are available to temple location which falls under tehsil Chenani of district Udhampur. The road link is available to the villages stated above from where one has to walk on foot. 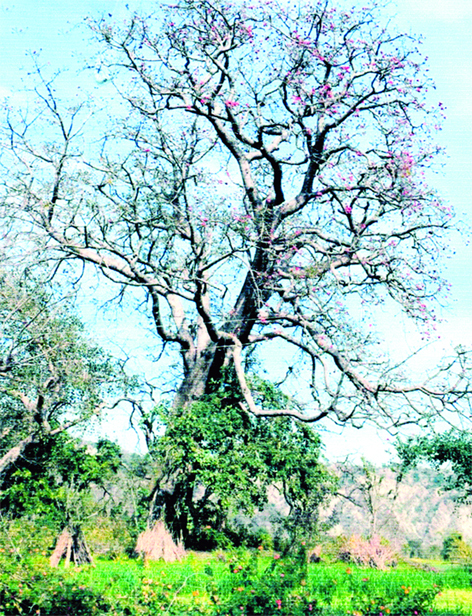 The distance from Mantalai is about seven kms. 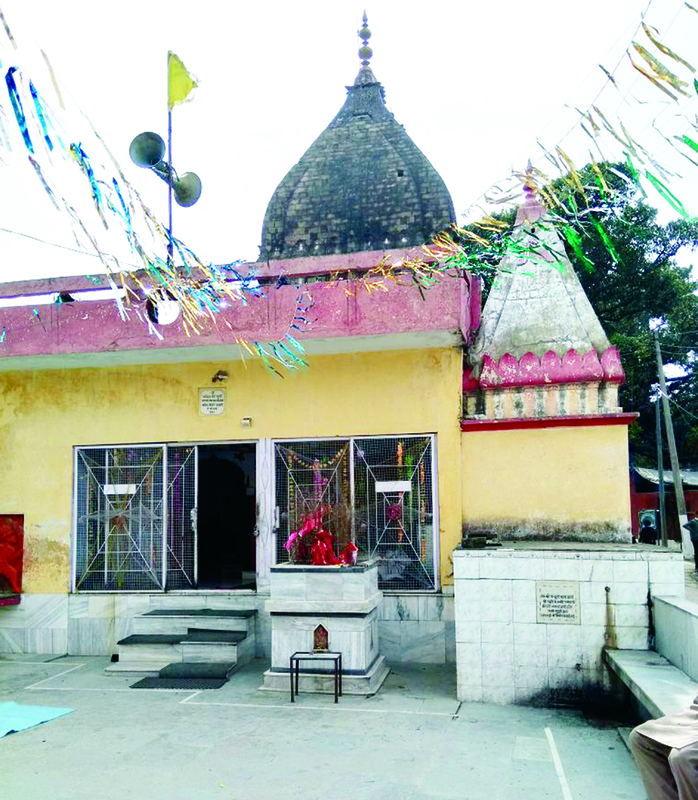 A self manifested pindi of Mata Naina Devi is existing in the temple. One more new temple was got constructed by Swami Dhirender Brahamchari few years back wherein an idol of Mata Naina Devi has been installed. Swami ji also started construction work of road from Mantalai to temple location where soil cutting work was completed by the time death overtook him. Since then no further progress was made to upgrade the road. 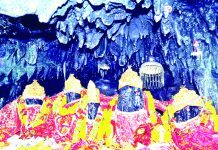 There are many legends prevailing about Mata Naina Devi which have also the support of scriptures. 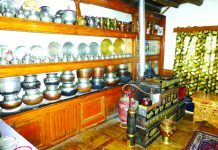 One such legend reveals that once a yagna was organized by Dakh Prajapati at Kankhal. In a previous Yagna conducted by Daksh Prajapati at Namisharmy (Sitapur Distt of UP) earlier, he tried to offend Lord Shiva. Since that time bitterness grew in relations between the two. Lord Shiva was not invited in the Yagna so arranged. Sati insisted to join the yagna organized by her father. Lord Shiva refused to join the yagna so organized . Lord Shiva was unwilling to join uninvited but Sati wished to attend. 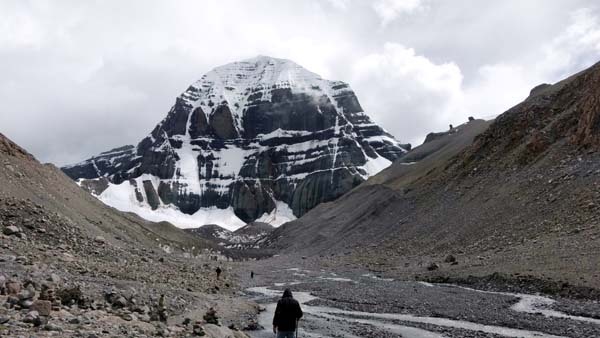 However, after pacifying Lord Shiva, Sati reached the spot where yagna was being conducted. No body spoke to her nor any share was allotted for Lord Shiva. Distressed with grief and agony of insult to Lord Shiva she jumped into the burning fire of Havan Kund to immolate herself in the yagna. The moment Lord Shiva knew about this tragic incident, he deputed his guard Virbhadra and Mahakali to destroy the Yagna. A fearful monster was born from the each hairpores of Virbhadra. All of whom formed a group of ghosts to destroy the Yagna. After killing everybody present in the sacrifice they began to create havoc in the whole world. They started to exterminate the entire creation. Lord shiva became furious, reached at the site and picked up the corpse of Sati on shoulders and started moving from one place to the other also called as ‘Tandav Nritya’. This horrified all the deities in the heaven as this could lead to holocaust. This urged Lord Vishnu to unleash his chakra that cut the Sati’s body into fifty one pieces. In some scriptures bow and arrows are stated to have been used, Where ever limbs of Sati fell there became a Shaktipeeth. The principal Deity of that point was called with different names, where eyes of Sati fell down the that point was called Naina Devi. 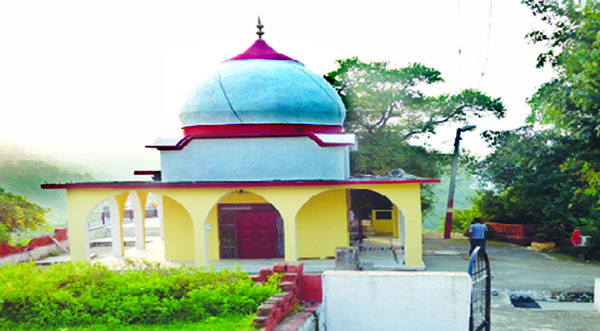 As far as Naina Devi temple of Badan forest is concerned it is said that long back a self manifested Pindi of Mata Naina Devi appeared in the house of an individual of village Bap. 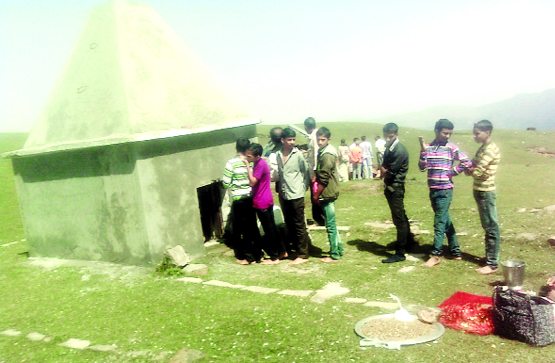 Each member of family was astonished to see the self manifested pindi of Mata Naina Devi. Mata appeared in a dream of house owner stating that she was Naina Devi who was appeared to remove the suffering of the people so he should carry the pindi to near by forest and install accordingly. The next morning the owner of house carried the pindi to near by forest and kept at a point just to relax for a while. He again tried to carry the pindi but he could not pick it up because of natural increase in the weight. He then realized that Mata wishes to stay at this point. The pindi was installed and temple was constructed at this place among Deodar trees. 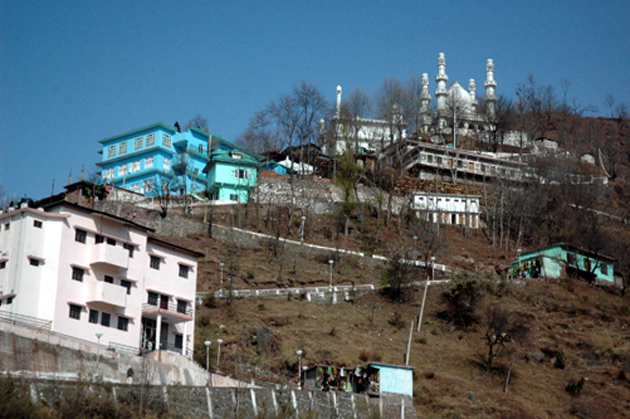 The population of the area started worshipping Naina Devi. Mata fulfilled the aspiration of the devotees. There lived a Sadhu for years together in the service of the temple. It is said that once he ran away with the pindi of Mata. 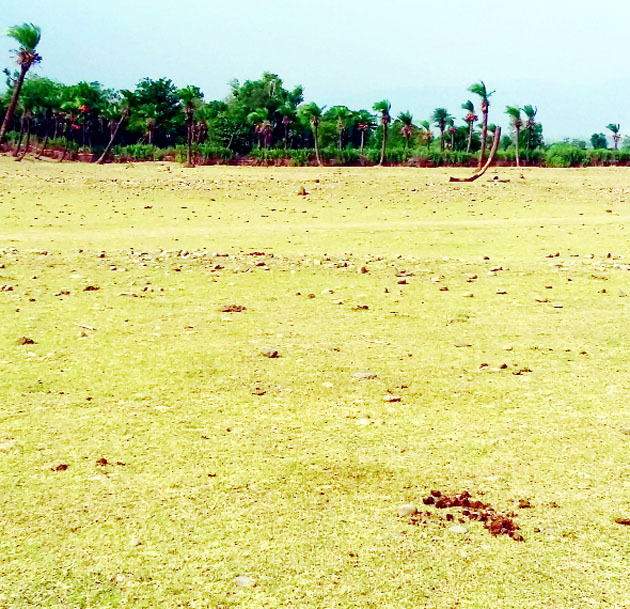 The residents of surrounding villages assembled and started searching him. After getting some clue the residents traced him on the other side of river Chenab. The matter was also reported to police. During their night stay at that place Mata again appeared in their dream and instructed them that they should not take any action against Sadhu. He is carrying me to a right place. One more pindi shall appear from this pindi and you may carry to my temple. The newly manifested pindi during night was brought to temple and was installed there for puja. Since those times the residents started an annual ‘Jatar’ of Mata. A silver mace is also kept in a village house where Jatar takes place. 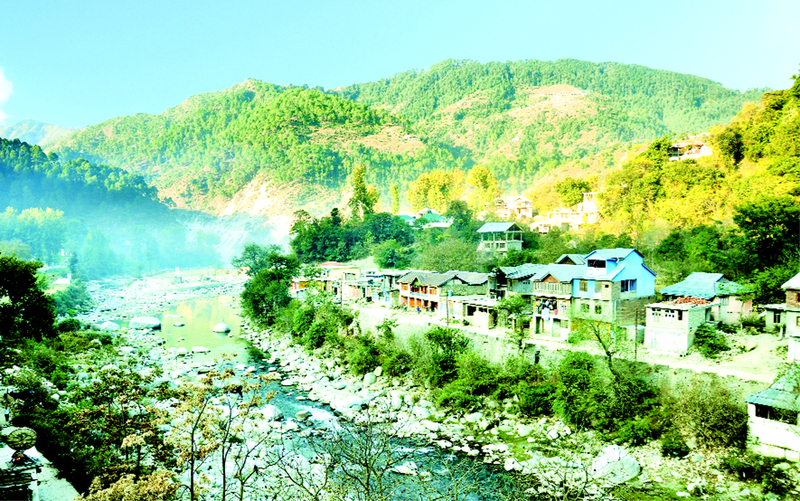 The devotees in whom the spirit of Mata Naina Devi enters are called ‘Dwalas’ in local dialect. Their body shivers in a strange way and they beat themselves with iron mace. 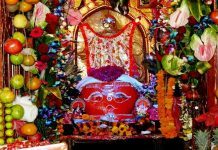 Some questions are also put to them regarding the happiness of Mata which are subsequently replied by them. Drums are beaten and flutes are played. A mela is also conducted on the first day of solar Ashaad month. It is also believed that a lion visits the temple from time to time which is reported to have been seen by many locals. Lion stays for a while in temple and goes back to the forest but by the grace of mata no untowards incident has taken place so far. In order to increase the number of devotees for obeisance of Mata Naina Devi, it is imperative that construction work on damaged road from Mantalai to Naina Devi should immediately start to facilitate the devotees visiting Naina Devi temple besides improving other infrastructural facilities.